We'd love to hear from anyone who would like to get involved. You don't have to be an expert. The Bega Valley Seed Savers network is striving to increase the number of varieties that we offer, and we're really interested in tasty varieties that have performed well in the local region. We are really keen to meet people who are prepared to grow varieties through to seed and are willing to share the seed with the local community. In return we offer free access to any other seed in our collection. We also have links to other seed savers networks around the country and can track down specific seed for committed growers. If you can't help with seed growing but are prepared to help sort, clean and package you are most welcome to join in! We meet at every second Bega Market, from 9am to noon. Find us at the SCPA stall. You can subscribe to our email list to be kept up to date. But please ring to check, especially in the colder months, as the meetings are sometimes cancelled or moved. 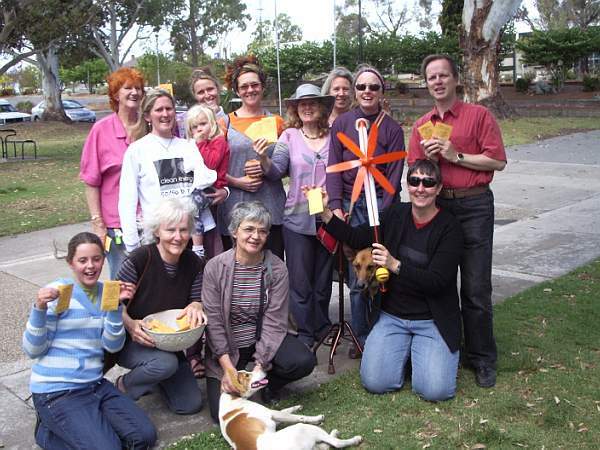 Some of our group joined up with one of the Climate Torches journeying around Australia on their way to Canberra. As local seed savers we are trying to make sure that our varieties are adapted to the local environment. We continuously select seed from the best performing plants in our gardens and this helps to create strains that excel in our soils and climate. We pay a lot of attention to the weather as it effects much of what we do. So we are very concerned about the long term changes that are forecast for our climate. We are each taking steps to reduce our impact on the environment and want the Government and businesses to do their part too.